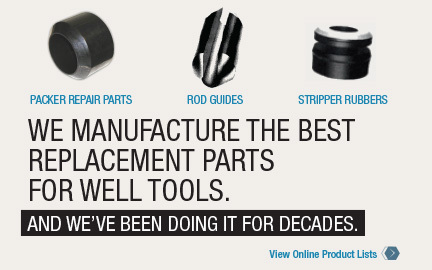 At MP Industries, our goal has always been to provide customers with excellent molded rubber oilfield products. For more than 30 years, we have been doing just that. From packer parts, stripper rubbers, sucker rod guides, valve parts and even seals, we continue to be the leaders in the production of oilfield mechanical molded rubber products! With the aid of our highly trained, caring staff and top-of-the-line machinery, MP Industries, Inc. ensures that our customers are always receiving the best replacement molded rubber oilfield products available. All of our products are made within the USA so you know you are receiving superior products backed by the same standard of service. We put decades of experience to use in order to provide our customers with replacement molded rubber products they can rely on in even the most hostile environments. Our products work effectively in temperature ranges from -50°F to +450°F and in environments from salt water to CO2 and H2S. Our parts outperform the competition even in the most difficult projects. That's what we call dependability with depth. This application was developed exclusively for the Oilfield Industry to match MPI rubber formulations on MPI products to the individual conditions in your work environment. And we offer it free to you. Part of delivering quality products to our customers comes from our product certification. This process allows products to be traced to batch number, processing condition, and date of manufacture.